Khun Mae often advises her followers to find time to offer alms to members of the Sangha- for example if one is staying in Singapore, there are a few Buddhist temples in which one may go to offer alms. This practice is something she still continues to do, up to today. Please read on the Commentary on Tirokuddanakanda Suttam which explains the significance of transferring merits. During Buddha’s time, King Bimbasara’s past life relatives who had been reborned as hungry ghosts came hoping for merits when King Bimbasara made a meal offering to the Buddha and the members of the Sangha. As King Bimbasara was not aware about them, he did not dedicate merits to them. That night, they made eerie sounds scaring the King. When the Buddha explained to the King what had happened, the King made another meal offering, “May this offering of mine be for the sake of my relatives (who are reborn as petas).” After that, the petas immediately was able to drink, eat and reborn celestial realms. Sometimes Khun Mae would chant this chant (aside from Yatha) during meal offerings. Below is a personal story that Khun Mae told me related to her late father. By the time Khun Mae’s father had been diagnosed with lung cancer, it is already at very advanced stage. Khun Mae had arranged for a Maha Sanghadana, in which is a dana to many invited monks which at the same time was also participated by her followers (many could not make it but had sent donations together with the name lists). Originally Khun Mae had planned to have the event later but she later brought forward the event to 1 February 2015 after noticing her father’s condition was deteriorating and he may not be able to hold on much longer. Khun Mae’s father rejoicing in the merits of the dana offering in Feb 2015, one month prior to his passing away. The invited monks first arrived at the main hall. This was followed by offering of requisites for monks (chanting book, various medicines, drinks and daily used items like shampoo). 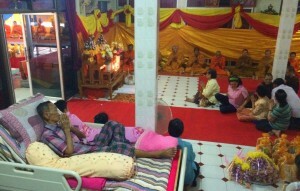 After that, the monks proceeded to Khun Mae’s father’s house. Prior to the lunch dana, a long chanting was held followed by transference of merits. Eventually as Khun Mae’s father’s condition deteriorated and he had to be hospitalized. Khun Mae and Mae Chi Suh Na took turns with Khun Mae’s younger sister to take care of her father in the hospital. When her father was conscious, her father remarked that he heard the sound of many monks chanting. He had thought that Khun Mae’s sister had played a chanting tape but in reality, she did not play any tapes. Khun Mae herself also heard the chanting. Her father continued to hear the sounds of monks chanting few weeks before he passed away on 20 March 2016. Khun Mae knew this was a good sign that her father would be reborn in a good rebirth. She also had a prophetic dream where she knew her father was reborn in a good realm. (Note: Hearing sounds of chanting when no one is chanting do sometimes happens- even I have personally experienced it before during an isolated retreat many years ago. Every evening as it was getting dark around the same time I would hear sounds of a group of people chanting. I had thought someone played a tape too. I had verified and confirmed no one was doing chanting or playing any tapes on speakers. There is a real story where a lady posed this question to Khun Mae. I thought of sharing it here as some of you may have similar doubts. During one of the events, the group had traveled and stayed in a very famous monastery in North East Thailand. As it was a difficult trip to make, Khun Mae arranged for us to order food for the monks’ morning alms (each one certain portion) and at the same time she arranged for transport for the group of us to buy other type of food such as wafers, biscuits, etc for offering. There was a particular lady who did not want to join in the alms. When Khun Mae inquired, the lady said that many people come to this temple to offer food because it is well known. There is just too much food until it probably goes to waste so she did not think there is a point. Khun Mae then explained to the lady that it is important that we offer alms – to transfer merits to the devas (who have been protecting and guiding us), departed ancestors, relatives and kammic debtors. When we offer to the Sangha, the monks who accepted the food would be chanting the transference of merits. Beings born in the hungry ghost realm would be able to have food to eat if the merits are being dedicated to them. The lady then remarked that she practices meditation and chanting constantly and she does her transference of merits after that. She felt it should suffice. Khun Mae then said that meditation and chanting is very important as well. However, often lay people may neglect the practice. Also, beings in unfortunate realm gets very hungry and very few people would be able to turn merits into food to feed them. Hence the practice of alms giving is also very important. Just like Tirokuddanakanda Suttam where departed beings may wreck havoc and create some obstacles, alms offering would help them to relief the suffering. And in gratitude to us, our lives may become smoother. Don’t dwell about food wastage, or if the monk had practiced well or not. This is not up to our part to judge. Our intention plays a role. When we give alms or perform any good deeds, it should always be done with the sincere intention to help other beings. Don’t give and expect that life would immediately change as different people have different levels of obstruction. For some of us, it takes time before we can see results. Offer with sincerity- try to make time to go to a nearly temple with some food offerings as often as you can. Each time, remember to share merits with your family, guardian devas, ancestors, departed relatives, kammic debtors and any beings who is able to receive the merits from the alms.